Photograph depicts a fairwar of the University Golf Course at the University of British Columbia.Six golfers walking or playing on fairway in centre of image framed by trees; mountains in background. 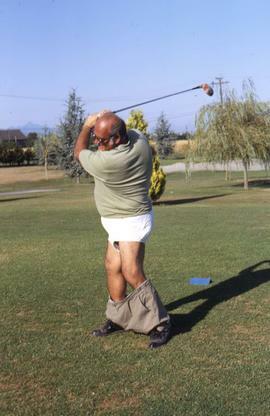 Colour Kodachrome 35mm slide depicts an unknown man mid golf swing with is pants down around his ankles. 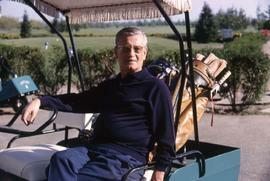 Colour Kodachrome 35mm slide depicts an unknown man sitting in a golf cart with golf clubs on the back of the cart. Colour Kodachrome 35mm slide depicts an unknown man sitting on a saddle with unknown people walking on a golf course behind him with golf pull carts. Colour Ektachrome 35mm slide depicts an unknown man, wearing First Nations style clothing, on a white horse with people standing around the horse looking on. Probably taken at a golf course. Colour Kodachrome 35mm slide depicts unknown men on a golf course with two of the men leaning down preparing for a putt and there is a sign in the background that says "Carling, B.C. Open". Colour Kodachrome 35mm slide depicts an unknown woman posing for the camera beside a light blue golf cart. Photograph depicts a view of water through trees.Large cedar trees frame view of small lake or pond, probably man made, in centre of image; carefully manicured lawn behind water, possibly a golf course. Colour Kodachrome 35mm slide depicts a view overlooking the shore of the golf resort Turnberry.